Newcastle Thunder have signed young forward Conor Fitzsimmons from Castleford Tigers. 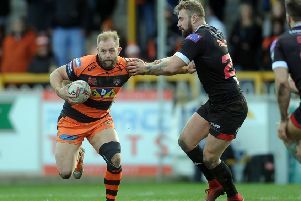 The 19-year-old back rower or prop made two Super League appearances for the Tigers, but has moved on with the chance of regular first team games with the League One club. Fitzsimmons has a full season of League One rugby under his belt, having spent 2017 on loan with Workington Town, for who he made 22 appearances over the year. He joined Castleford in 2015 from the Cumbria RFL Academy, initially on a trial basis, but impressed sufficiently to earn an 18-month deal and become captain of the Tigers under 19s squad in that time. Fitzsimmons also played twice in the Cas first team, both appearances coming against St Helens in 2016. Making the decision to move to the North East after his first meeting with the coaches and visit to Kingston Park Stadium in September, Fitzsimmons states it is the potential of Thunder that made the sale. He said: “I came to see Jason back in September and was instantly sold on the club. I thought that everything was in place for the club to progress to the next level and I wanted to be a part of that, playing good rugby on a regular basis. Head Coach Jason Payne said: “I’m delighted Conor has joined the club, he is a young player with huge potential and I believe he has a great career ahead of him. Originally from Cumbria, rugby league is what he loves to do and this is obvious in the way he plays. “From the first meeting we had with Conor we knew he was the type of person we wanted at Newcastle Thunder, he impressed us straight away with his hunger and ambition. Conor is as tough as they come and the way he presents himself is way beyond his years. “He has learnt so much from his time at Castleford and I’m sure his experiences there will serve him well in the North East.